Be prepared to be in awe of this beautiful attraction! 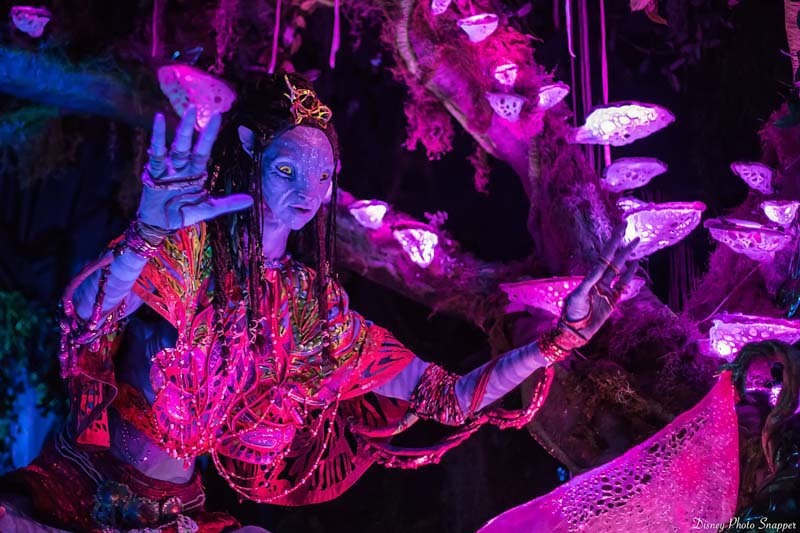 Opened May 27, 2017, Na’vi River Journey is one of the two incredible attractions in the new Pandora – The World of Avatar area in Disney’s Animal Kingdom theme park. We just had to share our experience with you! So, sit back, relax, and get ready to boat with us through sheer beauty. Picture this… you climb aboard a small boat and feel the slow river push you along. The space around you is glowing as if bioluminescent lighting has struck the rainforest with beauty! The sights and sounds appeal to the senses as you drift down river. Pass caves, exotic plants, and interesting animals to reach a very important member of the Na’vi tribe. Sound amazing?! It truly is! The best word to describe this family friendly journey down river would have to be alluring, as every inch of the rainforest seems to allow you to connect deeper with the story of the attraction. The Pandora – World of Avatar area in Animal Kingdom is based off the popular 2009 science fiction film, Avatar. In the movie, humans attempt to colonize on a habitable moon called Pandora. The locals, known as Na’vi, have a deep connection with their world and surroundings. On this slow-moving boat ride, you’ll have a chance to travel down a river in Pandora’s Valley of Mo’ara. The river is full of Pandora’s amazing nature. You will even come across a Na’vi Shaman – the leader of the Na’vi tribe. This Shaman is known as “Shaman of Songs”. If you haven’t had a chance to watch the movie, we recommend doing so prior to riding Na’vi River Journey so you’ll have a greater appreciation for all the beauty you are about to embark on. After entering through the park entrance and into the Oasis, you’ll want to make a left at the Tree of Life. Follow signs to Pandora, where you will make another left just before the Pizzafari restaurant. Shortly after passing Tiffins and Nomad Lounge, you’ll begin to see a change in your surroundings. The most noticeable sign you’ve reached Pandora is the “Valley of Mo’ara” sign followed by a huge Pandoran plant known as the Flaska Reclinata located on your right. Keep walking straight down this walkway. You’ll notice a restroom on the left, a Pandora Drum Circle on your right, and will finally see a simple, yet noticeable entrance to Na’vi River Journey directly in front of you. If you go under a floating mountain, you’ve gone too far! Please note, there is a second entrance and exit from Pandora that is located just past the Festival of the Lion King show in Africa. If you are coming in from this direction, walk over a lengthy bridge. You’ll know you’ve entered Pandora by the sounds and sights of the landscape. Keep straight on this path until you have to make a left of right. Make a right. You’ll again spot the drum circle on your right and the entrance to Na’vi River Journey directly in front of you. Disney considers this four and a half minute Na’vi River Journey’s thrill level under the “slow rides” category. There are no height or age restrictions for this attraction and lap seating is allowed for infants. Guests must be able to transfer from a wheelchair/ECV – although we are still curious as to why transferring is required on this attraction. 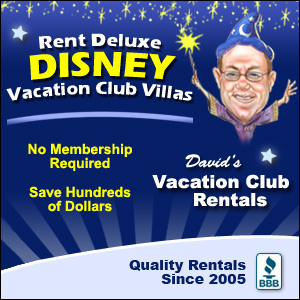 This was the most disappointing part of the attraction for our party as we had a member unable to transfer. We believe Disney could easily add a special boat for non-transferring guests to enjoy the attraction. Other accessibility information provided is audio description and handheld captioning. Rider Swap is available for all those wanting to ride, but needing to wait for your party to exit the attraction so they can stay back with the member in your party not able to ride (such as a non-transferring guest in your party). 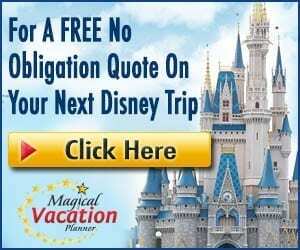 5 – FastPass If Possible! Animal Kingdom is now on a tiered FastPass system, much like Epcot and Hollywood Studios. When selecting your three initial FastPass in advance, you can choose one FastPass selection from tier 1 and two FastPass selections from tier 2. Tier 1 attractions include Avatar Flight of Passage or Na’vi River Journey – the two new Pandora attractions. This means that regardless of how you swing it, during your initial three FastPass selections, you must select between Avatar Flight of Passage or Na’vi River Journey. Both are popular for different reasons! 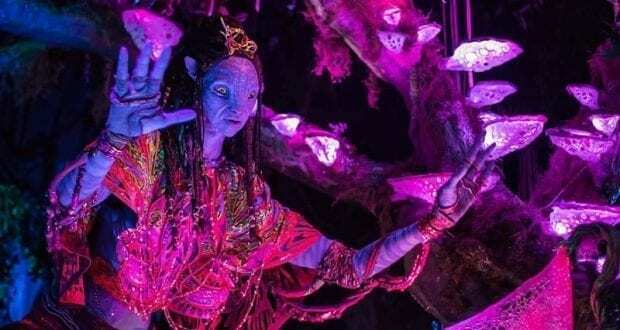 If you decide to FastPass Avatar Flight of Passage, we recommend heading to Na’vi River Journey immediately upon park opening. It is especially important for Pandora – The World of Avatar attractions to book your FastPass selections 60 days in advance for Disney Resort guests or 30 days out for non-resort guests by using your My Disney Experience account. With no FastPass, plan for very long waits in the stand by line-anywhere from 1-2 hours. Na’vi River Journey has the greatest details we’ve ever seen on one of Disney World’s attractions. Just absolutely stunning to put it plainly! If you’ve ever experienced one of Disney’s boat ride attractions such as Pirates of the Caribbean at Magic Kingdom or Frozen Ever After at Epcot, the process for loading and unloading your boat is the same. We were however surprised at the smaller size of the boat – with only two rows in each boat. At this point, it’s just a matter of sitting back and relaxing as you float down river. 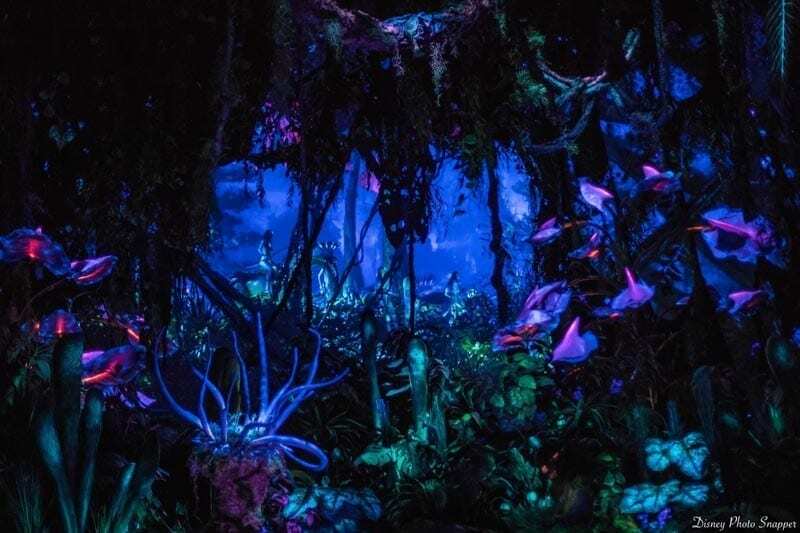 The way the bioluminescent rainforest glows is similar to what Pandora – The World of Avatar land looks like at night except with even greater detail. We found ourselves looking up a lot at the creatures floating and crawling above our boat. Catch glimpses of the Na’vi people and animals with awesome screen technology that looks like what is being displayed in the distance is actually within reach. We particularly enjoyed the calming and inspirational music and sounds of nature all around us! The river journey comes to an end just after encountering the Na’vi Shaman of Songs which is an audio-animatronic that is nearly 10 feet tall – the typical height of Na’vi. We loved her singing and fluid movement which was made possible with Disney’s technology programs that provide fluid energy into her every movement. Overall, we can’t say this is a new favorite of ours, but we do rank it up there as a must-do at least once. Surely, you’ll want to take home a souvenir to remember your journey down the Na’vi River. You could visit the popular Pandora gift shop known as Windtraders for awesome Pandora merchandise like clothing, robotic banshees, and make-your-own Avatar. Windtraders however is at the other end of Pandora from the Na’vi River Journey. If you aren’t headed down to Windtraders, the Colors of Mo’ara kiosk is located near this attraction. They have fewer souvenirs but still have some great items, plus they offer face painting if you too want to join the Na’vi tribe in appearance!